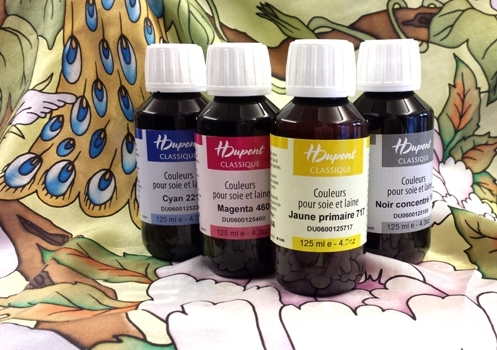 A bottle each of 221 Cyan Blue, 460 Magenta, 717 Jaune Primaire and 100 Noir Concentre (Cyan Blue, Magenta, Primary Yellow and Concentrated Black) the ideal basics for mixing colours. Dupont dyes are used by many professional and amateur painters, and are well-known for their high quality and beautiful colour range. They need to be steam-fixed in a steamer, or can be used for abstract effects in the microwave.